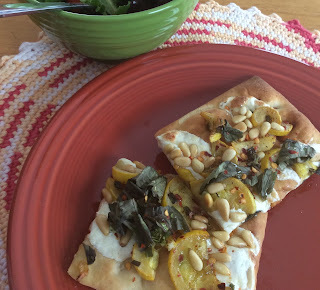 I made my second Hello Fresh meal this morning for breakfast......yellow squash flatbread. The assortment of ingredients and spices made this usually plain dish, quite nice. The only thing I'd change is to really reduce or even remove the red pepper flakes - too overpowering in my opinion. Another recommendation from Foodie Mama for Hello Fresh. Here is the recipe. Simple and quick. 1 - Preheat and Prep - Wash and dry all produce. Adjust rack to upper position and preheat oven to 450 degrees. Halve the squash lengthwise, then slice into thin half-moons. Trim, then thinly slice scallions. Halve lemon. Halve tomatoes lengthwise. Pick basil leaves from stems; discard stems. 2 - Toast Pine Nuts - Heat a large pan over medium heat. Add pine nuts and toast, tossing frequently, until golden brown, 3 - 4 minutes, being careful not to burn. Remove nuts from pan and set aside. 3 - Cook Scallions and Squash - Heat a drizzle of olive oil in same pan, over medium heat. Add scallions and cook about 30 seconds. Add squash and cook, tossing, until soft and very lightly browned, about 5-6 minutes. Season with salt and pepper. 4 - Bake Flatbread - Place flatbread on baking sheet. Tear mozzarella into small pieces and scatter over flatbread. Top with squash mixture. Bake in oven until cheese is melted and flatbread are golden brown, about 10 minutes. 5 - Toss Salad - Meanwhile, toss mixed greens, tomatoes, a squeeze of lemon, and a drizzle of olive oil in a medium bowl. Season with salt and pepper. 6 - Finish and Serve - Once flatbreads are done, scatter with basil, pine nuts, and chili flakes (to taste). Drizzle with honey. Cut into slices and serve with salad on the side.